As it is, 4K is still quite expensive to run as a native resolution for most needs. The monitors themselves are expensive, and the hardware required to run these products efficiently also come at a hefty price. There are those, however, who would prefer to use 4K displays for general purposes such as browsing, processing documents or watching 4k media. These applications did not even cross the minds of consumers back then since offerings with this feature are in the thousands of dollars. Fast forward to today, surfing the web, gaming and other mainstream uses are made possible thanks to more affordable selections readily available to cater to these types of needs. The AOC U2879VF fits this situation quite easily since its $329 price tag (as of this writing) adapts to a wider audience when it comes to the budget. Even at a time that has witnessed significant price reduction in the UHD category, consumers are going to find it difficult to find a suitable match to compare against with this product since it also incorporates Freesync to match its demanding native resolution. 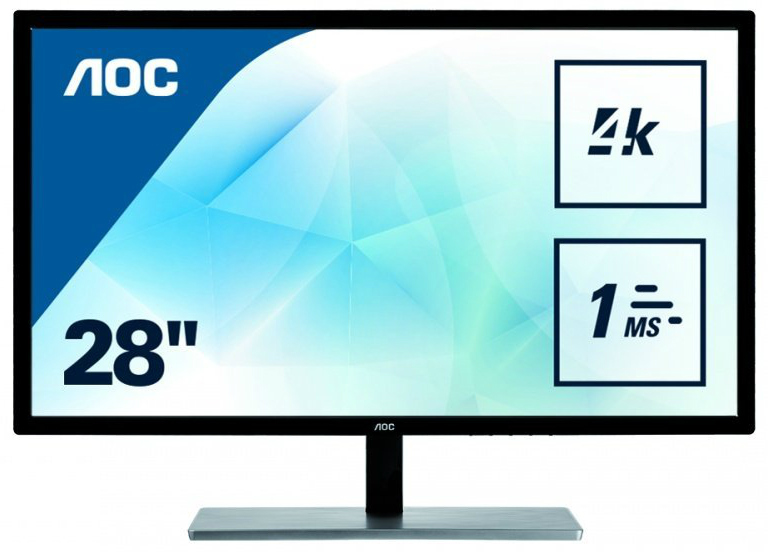 The nearest competitor is priced at over $400 on Amazon at the time of this writing, so it’s safe to say that AOC’s budget 4k offering in the aoc U2879VF quickly makes it a contender for budget-conscious consumers looking to up the ante on desktop viewing. 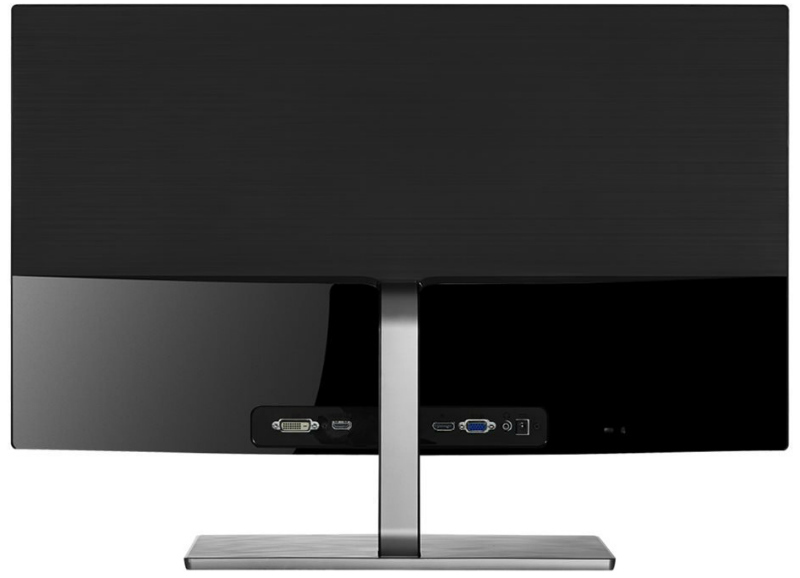 Unlike most of the extravagant-looking 4K models we have seen, AOC went in the opposite direction with the U2879VF. This product is sporting a rather simple design; the cabinet has two tones comprising of matte and glossy on the other, particularly on the rear shell that holds the module. Bezels are adequately thin at 17mm, surrounding the screen that has an unnoticeable matte AG coating that does its job fairly. The OSD buttons are neatly tucked under the bottom bezel hidden from plain sight. Buttons are surprisingly good for an affordable product since they offered a clicky response when pressed and didn’t feel loose. The stand included is rather straightforward since it does not provide any showy decorations, but rather it does provide an elegant taste, especially when looking at the side and the brushed aluminum finish. This mechanism only offers tilting ergonomics, but you cannot expect a lot from such a simple feature. Input options are also adequate for general use since there is a port each for DisplayPort 1.2, HDMI and DVI plus another one for VGA legacy connectivity. AOC is generous enough to provide a cable for each of these receptacles, but one thing missing from these characteristics is the inclusion of USB ports, even if that is a minor exception. The AOC U2879VF utilizes a TN panel from Innolux, similar to what other 28-inch 4K offerings from other brands have. Upon testing this display using its factory calibration, colors were a bit off since the reds and blues were slightly off from their ideal outputs. In practice, these did not appear to be a critical flaw, but adjusting and correcting these discolorations are required. We also found the contrast performance of the panel to have acceptable levels, since blacks and grays were quite good, except for the lighter shades which were too light and appeared to be unnoticeable resulting to poor color detail performance. This flaw, however, is not a deal breaker since the overall performance is acceptable for daily use. For professional applications, you might need to look elsewhere. If you find tweaking the full-color settings, this product includes to be inconvenient, one way to correct these flaws is to activate AOC’s sRGB mode in the OSD. Once selected, accuracy instantly improves when compared to the default, and colors become vibrant and correctly saturated, considering the U2879VF has TN. Although for certain, IPS models are far better at this aspect than any similar offerings to this product. The mentioned sRGB mode sets the brightness to around 220cd/m2, and still allows adjustment for it and the color settings, but we found the initial changes it provides is the best choice you can take. Regarding brightness, this model offers a decent overall performance, from its maximum level of 280cd/m2 and no apparent light leaks and acceptable uniformity. But on the contrary, you can’t expect deep, oily blacks from the screen like the ones we have seen from more expensive models. Amazingly, AOC managed to include Freesync into the features of this budget-friendly product, further emphasizing the value it provides for the consumers. Similar products with this feature cost at least a hundred dollars more. Although one downside lies in the operational framerate range of 40 to 60hz, which is rather limited. That fact is, however, the fault of only having 60hz, but in gaming tests, we did not experience any regular fluctuations below that range. To experience the benefits of this tech, make sure your computer is capable of staying within those frame limits, so as not to lose Freesync functionality when you are gaming. Another downside is the high input lag this model has, which resulted in around 30ms difference. This downside isn’t particularly bad for casual gamers, but for competitive titles which require quick reflexes, the differences may become apparent. Some blurring also became noticeable in our tests, and we found the overdrive option in the OSD to be of good use to alleviate this problem, and selecting the medium settings presents the best choice with lesser apparent blurring and advanced ghosting. Apart from all of these technical details, the AOC U2879VF is also flicker-free so casual gaming at home for hours on end won’t be harmful to your peepers. Judging from the pricing alone, we can safely conclude that the AOC U2879VF was meant to be an entry-level all around monitor since it does not particularly excel in gaming or professional uses. One thing that makes it outshine its more expensive rivals is its cost to performance ratio with regards to its acceptable performance and UHD resolution, which makes it difficult to compare more expensive 4K offerings available in the market. As for the aesthetics, this model looks quite simple and unassuming against the current gaudy trends other brands tend to follow with their offerings, but in some circumstances depending on individual taste, less is more. If you are looking to test the waters with 4K, or if you have a limited budget and in need of a display for your UHD media, choosing to save the extra cash with the AOC U2879VF is a healthy option. The hundreds of dollars you can save by choosing this offering over more expensive 4K solutions can go to GPU updates to make your computer efficient at 4K production, or for upgrading to a better model in the future.